Music, visual art, theater and other creative programs help children develop important cognitive, fine motor and social skills. Yet each year, public school districts face deeper cuts in school budgets for arts programs. What can be done to ensure public school students are exposed to these formative experiences? 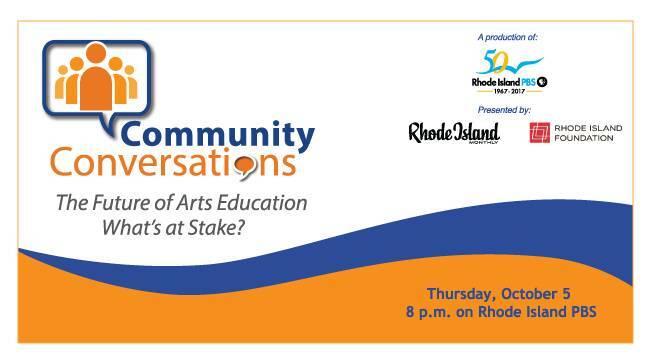 On Thursday, October 5 at 8 p.m., Rhode Island Monthly and the Rhode Island Foundation present the latest edition in the Rhode Island PBS Community Conversations series, The Future of Arts Education: What's at Stake? Host Mario Hilario moderates a discussion with a panel of guests and the live studio audience, as they explore the issues, options, and innovative responses from schools, parents, students, and the greater arts community. The discussion is inspired by an article in the September issue of Rhode Island Monthly magazine. The article cites research showing students perform better in core subjects when they are involved in the arts, particularly if they are from low-income neighborhoods. According to a longitudinal study published in 2012 by the National Endowment for the Arts, low-income students who have a history of in-depth arts instruction earned better grades in science, math, and writing — and were three times more likely to earn a bachelor’s degree — than their peers with less arts exposure. Dr. Wagner will be joined on the show’s panel by Daniel Lee White, theater artist in residence at Providence’s Trinity Academy for the Performing Arts; Kerry Murphy, fine arts teacher at Johnston High School; and Casey Nilsson, associate editor at Rhode Island Monthly and the article’s author. The program also features segments taped on location, including at the Manton Avenue Project. The full article is available online at Rhode Island Monthly. Community ConversationsThe Future of Arts Education: What’s at Stake? airs in high definition on WSBE Rhode Island PBS over-the-air at digital 36.1; on Rhode Island cable services: Cox 08 / 1008HD, Verizon FiOS 08 / 508HD, Full Channel 08; on Massachusetts cable services: Comcast 819HD, Verizon 18 / 518HD; on satellite: DirecTV 36 / 3128HD, Dish Network 36. The program will be available for streaming online through the station’s Website after television broadcast.